A double DVD release featuring a collection of new, intimate interviews with Priscilla and Lisa Marie Presley. 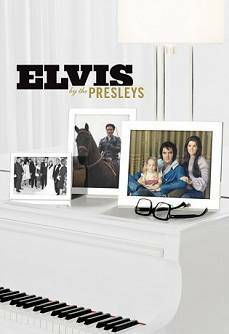 It also includes some exclusive, never-before-seen television performances, photographs from the Presley Estate archives and Presley family home movies. Rare interviews with Elvis's first cousin, Patsy Presley Geranen, and Priscilla's parents, Ann and Paul Beaulieu, are also featured. Private home movies of the Presley family illustrate and illuminate his story. Different aspects of Elvis's life, including his tours, his time in Hollywood and his home life, are depicted with the insight that only his family can bring. His career ups and downs, his kindness and generosity and his human frailties are all brought to light as well as a reflection on his place in entertainment history and his enduring legacy. Released in May 2005. Containing 2 DVD's. I bought Elvis By The Presleys yesterday, both the DVD and the CD. Disc 1 of the DVD has a running time of approximately 2 hours and 35 min, and I must say that I was pleasantly surprised with it's content! The 2,5 hours went by quickly, and it all was put together professionally, and I wasn't bored one single minute! Priscilla, Lisa Marie, Jerry Schilling, Cilla's parents (nice people!) and Patsy Presley were the ones who did most of the talking, and they all succeeded in making the programme enjoyable! The mood? Changed a lot, from very amusing, funny stories to the darker side so to speak. And of course the end, with the divorce, Elvis' downfall and death were rather emotional... as expected. But it was all done nicely and it looked SINCERE when the people interviewed talked about it! That counts a lot! Disc 2 of the DVD has a running time of approximately 1,5 hours. I wasn't equally impressed with the content of this part, but nevertheless it's a nice piece of work by the people behind this project! I only wish that there were MORE never before seen clips, and especially the bonus material should have been extended! For instance, I can't for the life of me believe that the few minutes we get in the Karate section is all there is from Elvis' 1974 Karate project, THE GLADIATORS? But I won't complain a lot. This double DVD is worth the money you spend for it, so go get it! CD 1 consists of the "known material", so to speak. Disc 2 should of course have had many more "rare" tracks and outtakes, but after all it does contain a few rarities that's not so easy to get for the casual buyer these days. The home recordings of Baby What You Want Me To Do and I'm So Lonesome I Could Cry from Linda Thompson's house makes a VERY interesting debut, officially! Funny that Cilla has agreed on this..? But very welcomed! Final conclusion: The DVD is highly recommended and should be present in every Elvis fan's collection! I give it a 4 out of 5! The CD is not essential at all, but it makes a nice companion to the DVD. I give it a 3 out of 5, only because of the "rare" material on disc 2.